The United States has filed a complaint with Turkey over its leaders’ attacks on Israel, after last week’s alleged airstrike in Syria. The United States has filed a complaint with Turkey over its leaders’ attacks on Israel after last week’s alleged Israeli airstrike in Syria. Speaking to reporters on Tuesday, State Department Spokeswoman Victoria Nuland said that the “inflammatory comments” by Turkey’s Prime Minister and Foreign Minister were “very troubling” to the U.S.
“We have in the last 24 hours conveyed our concerns on this matter with senior Turkish officials. Our view here is that all of us need to keep our eye on the ball, which is to get the violence to stop, to get Assad to step down, and to turn the page towards a democratic Syria,” said Nuland. On Saturday, Turkish Foreign Minister Ahmet Davutoglu criticized the Syrian government for failing to respond to the alleged Israel airstrike, suggesting that the Syrian stance raises suspicions that there is a secret deal between the two countries. “Why has the Syrian army, which has been attacking its own people with warplanes and tanks for 22 months, not responded to this Israeli operation?” Davutoglu asked. A day later, Turkish Prime Minister Recep Tayyip Erdogan accused Israel of waging "state terrorism" as he condemned the alleged air strike as an unacceptable violation of international law. 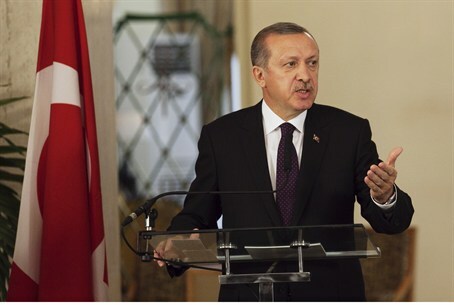 "Those who have been treating Israel like a spoilt child should expect anything from them, at any time," Erdogan said. Both Erodgan and Davutoglu ignored the fact that just several months ago, the Turkish army attacked several targets in Syria after a mortar shell fired from Syria exploded on Turkish territory and killed five people. On Monday, a member of the Turkish Labor Party turned the tables on Erodgan and Davutoglu, claiming that Israel and Turkey collaborated with one another to allow Israel to carry out the attack on Syrian territory. Israel has not commented on the attack, and has not officially confirmed its involvement, although Defense Minister Ehud Barak on Sunday hinted at the possibility that Israel did carry out the attack.